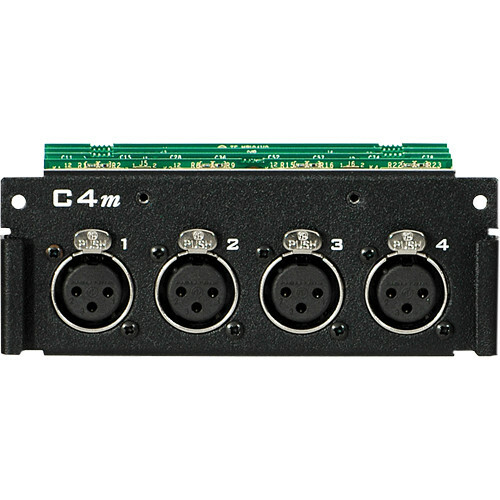 The C4m Mic/Line Input Card from Aviom provides four remote-controllable mic/line-level inputs for modular AllFrame systems. Essential channels strip controls such as gain, phantom power, low-cut filter, and phase are individually controllable. Up to six C4m cards can be installed in a single F6, the host frame for the modular AllFrame system, putting up to 24 remote controlled mic preamps in a single location. Once digitized, the signals can be routed anywhere in the Pro64 network and output in a variety of formats including analog line-level, mic level, AES3 digital and/or directly into a Yamaha console with a 6416Y2 A-Net Card installed. I/O cards can be mixed & matched to create custom Pro64 devices configured for your specific needs. The modular nature of the I/O cards in an AllFrame system allow the user to reconfigure the network's I/O devices to suit the needs of the application in just minutes. Insert PEM FEOX-440; Use size #4 machine screw with 40 threads per inch.